Chennai : Dravida Munnetra Kazhagam (DMK) leader M.K. 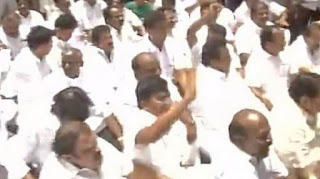 Stalin and several other party leaders were detained after a ruckus was created over the MLAs sting operation in today's Tamil Nadu Assembly session. "The TN speaker forcibly evicted us from the Assembly. This is a murder of democracy," Stalin had said before being detained. "I raised the matter in the Assembly and sought explanation from the two accused MLAs in the sting. I also demanded a CBI probe into the matter. But we were evicted," he added. Earlier, the Tamil Nadu Assembly saw a huge showdown between the ruling All India Anna Dravida Munnetra Kazhagam (AIADMK) and the DMK over the sting operation in today's session, which was earlier being expected to be crucial for paving the way for the rollout of the Goods and Services Tax (GST) Bill on July 1. Thought the bill was tabled in the Assembly and passed successfully, a ruckus was created when Opposition leader M.K. Stalin raised the issue of "cash for MLA" expose, carried out few days before by a Engligh news channel. Speaker P. Dhanapal refused to discuss the issue on the floor of the house as it was subjudice. He further said the issue cannot be discussed also because there was no major proof to substantiate it as it only came out in the media. Following this, the DMK MLAs showed pamphlets written "MLAs for sale" over them as a mark of protest against the Speaker's assertions. Dhanapal supported his statements by citing the Nira Radia tape case that happened in the DMK's regime, following which the Assembly came to a stalemate. Palanisamy won the trust vote held in the state assembly on the back of support offered by 122 AIADMK legislators. South Madurai MLA Saravanan, who had deflected to the OPS faction, admitted on camera that Sasikala camp offered him money between Rs. 2 crore to 6 crore for his support. Meanwhile, AIADMK leader O. Panneerselvam has sought an explanation from his loyalist MLA S.S. Saravanan from AIADMK's rival Sasikala faction. "Lawmaker Saravanan in the sting operation gave some explanation. We have demanded the same explanation from him," O. Panneerselvam said. State Finance Minster D. Jayakumar refused to give an explanation apart from saying, "Like you, I also watched the TV. I don't know exactly what happened. The matter is pending before the court. Hence, it would be unwise to comment." The Dravida Munnetra Kazhagam (DMK) severely criticised the ruling AIADMK government over the matter alleging that the party's inter-relationship was purchased and not natural.